Chickens don't do well on grain alone. Supplement their diet with bugs and greens from around your yard. During a chicken-keeping workshop, the speaker recommended a chicken’s diet be about 1/3 grains, 1/3 greens and 1/3 bugs. That’s right—putting out a feeder of grain won’t cut it for your flock. 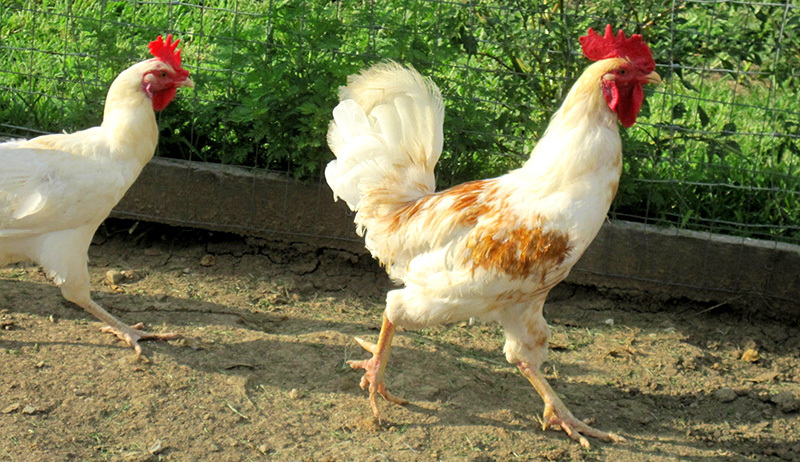 If your chickens are free-ranging on open pasture, they’re probably already getting the nutrients they need to be healthy, but problems arise for backyard birds kept in a coop or who have limited room to roam. That’s the case for my flock. Here’s a closer look how we meet our chickens’ other dietary requirements. 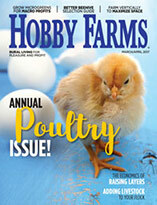 Perhaps it will give you some ideas for upping your chicken-feed game. 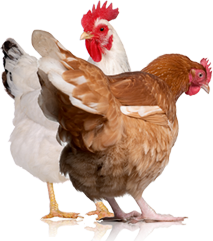 The grain portion of our chickens’ diet is easy because in our area, we have local distributors for organic layer feed and scratch. It costs more than non-organic, but that’s largely because there are so few feed mills dedicated to producing organic grains. Because organic mills are fewer and farther between, a lot of what chicken keepers pay for is shipping costs. But more organic mills are coming online, so prices should fall in the coming years. As for the grassy portion of their diet, we had to cut off our hens from free-ranging in our tiny yard. As you may know, even three birds scratching and foraging can wreck a lawn in a week or two. Let’s not even talk about the rapid distribution of chicken droppings all over the deck and patio! But I have found some tools and techniques for keeping more greens in their diet in addition to giving them weeds pulled from the vegetable garden and ornamental beds. I dug through the piles of “might be useful someday” objects in the back of the garage to find the bagging attachment for our mower. It had never seen any action because our mower shreds the clippings, and we just let them fall back into the lawn to feed the earthworms and replenish the fertility of the grass plants. But now, once a week, after each mowing, the girls get one bag of fresh grass clippings to peck at and devour over a day or two before they dry up. I figure the lawn can spare it. Of course, the lawn mowing slows down during the winter, just at the time the girls’ appetites pick up, so I’ve taken to tossing leftover vegetable and cover-crop seed along the outside of their pen. They can reach some of these leafy plants through the fence, and any they can’t, I cut and toss for them. To reduce my labor, I plan to put a roll of wire on the inside edge of the pen. That will form a place to toss seeds in the future where hens can reach all of the plants but only after the plants are rooted and tall enough to survive grazing. I’ve also been taking advantage of some biennials in the vegetable garden to provide greens for the girls. We always get a great crop of carrots, and from each one we harvest, we toss the tops in the hen pen. Chickens will knock each other down trying to get to the carrot tops first. But some carrots get too big and woody for us to eat. Because they are biennials, I pull them from the vegetable garden and replant the woody ones next to the pen. They keep growing and re-sprout tops that get harvested for the chickens. My hens don’t get 1/3 of their diet from greens yet. Maybe I should start growing duckweed in the water garden. The workshop presenter was selling a system for growing black soldier fly larvae as chicken feed to meet that last goal. If your chickens are free-ranging, finding a healthy buffet of insects to dine upon shouldn’t be difficult, but because I keep my flock contained, I was willing to give the black soldier fly larvae a try. My wife, on the other hand, vetoed any backyard projects containing the word “fly.” So instead of growing fly larvae, I’m building an in-ground worm bin for raising red worms. Most garden and kitchen scraps that already go to our compost bins, such as coffee chaff, paper, cardboard and worn-out cotton fabrics, now will go to feed the worms. You could do something similar if flies aren’t your thing either. 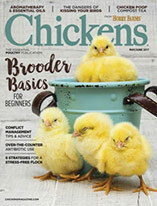 This article originally appeared in the May/June 2016 issue of Chickens.